For centuries sailors have been reporting on various creatures at sea that can be dangerous to ships and sailors. One of them is the Untouched, which is especially mysterious and dangerous. According to tradition, no human being has survived an encounter with these beings in order to report more about it. These creatures are known to almost all peoples and cultures on Solas who have ever sailed the open sea. Especially in the southern ocean there should be a large number of these creatures, which are responsible for the loss of ships again and again. Other names of these creatures are Mervois, Insérée, Miin, Neatin, Achhoota, Änisurma, Sípǔ and Dimma. Nobody can say for sure what the Untouched look like, but there are stubborn stories to tell that they are humanoid beings. They are said to look like beautiful young women with bird-like wings and a fishy abdomen and tail. When they lay their wings and settle on a rock in the sea, they appear from the distance like beautiful girls with long hair and bare torso. But the key feature is to be her voice. These creatures can sing a beguiling song that is carried miles and miles across the sea breeze, and magically gets even experienced crews to turn their ship and head for the rocks. Without caution or reason, the sailors steer their ships onto the cliffs and perish in the waves. All people and races describe the details of these beings a little differently, and adapt the look of the untouchables to their own. The truth is that there are no virgins or beings waiting on the rocks – this hallucination is created by the singing of the creatures that lurk just below the surface of the water and have targeted the ship’s crew as prey. The real Untouched are nightmarish sea creatures with a long fish or snake-like body. The legs and feet run into long fins, a long strong tail allows them agile and swift swimming. Their hands end in strong claws and their fangs are as dangerous as those of a shark. They are about the size of a human but much stronger. 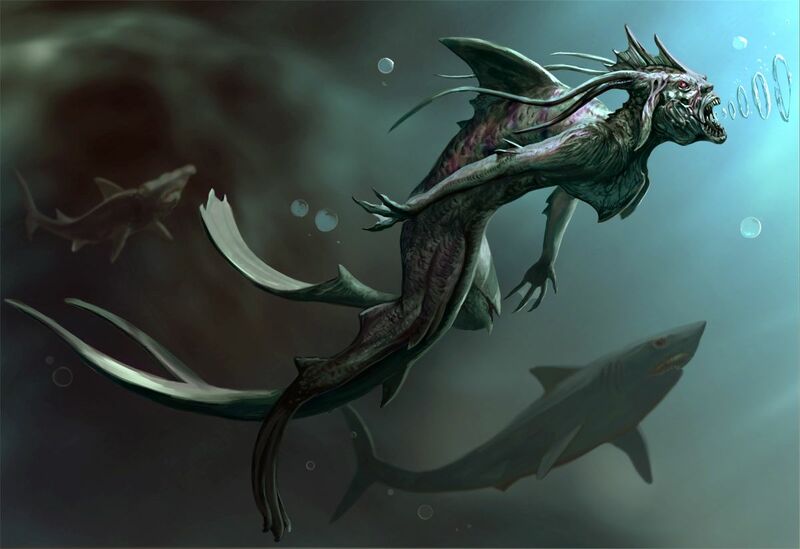 Underwater one can barely escape their grip and attacks – and they usually come in packs of 5-10 beings. Their fine hearing and their sense of smell perceive a ship from afar. They follow and some creatures stretch their heads out of the water and start their magical song, which ancient sources claim to be one of the most powerful spells ever heard of. When the ship turns the creatures swim ahead and lure it onto reefs, rocks or sand banks, where the enchanted crew sees the illusion of the supposed virgins. Once the ship goes down or hits land, the creatures fall on the crew, taking advantage of the sea. Usually they drag a victim underwater in twos or threes and drown them painfully. Then they swim into deeper waters with their prey , where they probably have their dwellings on the seabed and devour their victims. The belongings of the unfortunate sailors are carelessly thrown away. The creatures breathe with gills, but they can also breathe on the surface of the water for a while to start their singing. Likewise, they can emit a powerful scream underwater and with the sound pressure are able to stun or at least confuse creatures up to their own body size from a short distance.